Don't lose your position in the cue because you were wearing the wrong thing. Try some Italian designed dinner jackets by Tazio and see what happens. Tazio makes a huge collection of fine evening jackets and blazers that are all designed in Italy for the man who takes the way he looks seriously in public. 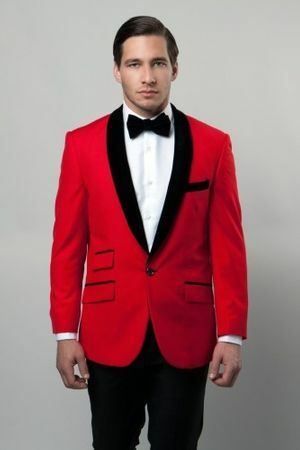 This red and black dinner jacket features stylish contrasting black trim on the collar for an authentic look that was made for the night life. Slim fit.